This article series discusses How to Repair Damaged Foundations, Foundation Cracks, Slab Cracks, Bowed, Buckled, Leaning Foundation Walls, Settled Floors. The photo above shows a bowed masonry block foundation wall with horizontal cracking that occurred due to earth loading at the time of construction, probably by vehicles driving too close to the foundation wall shortly after it was constructed. At this website we explain how it is sometimes possible to be confident about the cause of foundation damage which in turn helps assess the risk presented to the building and the repair methods needed for foundation damage, cracks, leaning, buckling, bowing, settlement. Before repairing a foundation crack it is important to diagnose the cause of the crack and its effects on the building structure. The significance of any foundation crack depends on the crack's cause, size, shape, pattern, location, foundation materials, extent of cracking, impact of the crack on the building, and possibly other factors as well. If there is an underlying ongoing problem causing foundation movement or damage, that problem needs to be corrected too. Cracks in poured concrete walls that are larger than 1/4", cracks which are increasing in size, or cracks which are otherwise indicative of foundation movement should be evaluated by a professional. At SHRINKAGE CRACKS in SLABS we discuss how we decide if a foundation crack needs repairing the first place. Repairs to foundation cracks which are not traced to building movement, structural problems, site problems, or other conditions which require site or structural repairs may be attempted for cracked foundations and other cracked concrete structural elements using a variety of products and materials such as masonry repair epoxy or sealant products. These products, some of which include even structural repair epoxies, might be used to seal against water leakage as well, and may be used for repairing certain cracks in concrete foundations following evaluation and advice from a foundation professional. An evaluation of the presence, absence, or condition of reinforcing steel in cracked concrete foundations should be a part of such an inspection. 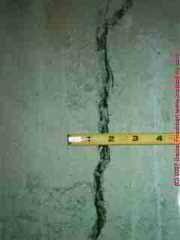 Shrinkage cracks, which are not normally a structural defect in a building, may nonetheless need to be sealed against water entry. Common repair methods include chipping out the crack and applying a masonry patching compound to the surface, use of epoxies, or other sealants. 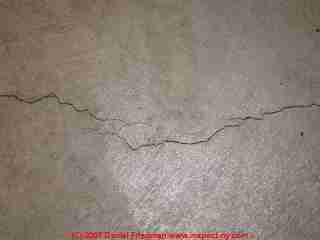 on POLYURETHANE FOAM INJECTION CRACK REPAIRS for details on using this product to seal foundation cracks against leakage. see SEAL CONCRETE CRACKS, HOW TO a description of various products and methods used to seal or repair cracks in poured concrete walls, foundations, floors, & slabs. Water entry leaks at foundation cracks: Polyurethane foam sealant is used for foundation crack repairs to stop water entry. (Also find and correct outside water sources). In the photos shown here, substantive cracks appeared and continued to increase in size in this poured concrete foundation used to support a modular home which had recently been completed. The cracks and foundation movement were probably due to a combination of: poorly prepared foundation footings, blasting on an adjacent building lot to prepare that site for new construction, and possibly omission of steel reinforcement in the poured wall. at VERTICAL FOUNDATION MOVEMENT REPAIRS where we explain and illustrate various methods to arrest foundation settlement, and where appropriate, to raise or level or reinforce settling or moving foundation walls or slabs. Additional details provided in that article include descriptions of grout pumping to stabilize soils or elevate slabs, slab jacking to stabilize or lift settled slabs over deeper unstable soils, the use of driven steel pins to stabilize settling foundation walls or footings, the use of helical piers or "screw piers" such as those provided by A.B. Chance to repair sinking foundations or to level floor slabs, and a similar use of friction piers such as those provided by Magnum piering - are driven piles which rely on soil friction against the sides of the pile. Since it's sometimes the only appropriate repair method for foundation damage, we also illustrate foundation reconstruction. With the Multipoint foundation you can have a steel frame floating foundation MPF that acts as a concrete raft slab but at only 10 lbs./ft2 so you are not overloading the already poor bearing conditions with a concrete slab at 200-300 lbs./ft2. The frame acts as a "Snowshoe" and the load of the building is spread out evenly over the site. The system has incredible bridging capacity which allows for loss of bearing in one location to be transferred to another set of feet or bearing plates. This technology is over 30 years old and has been used, without failure, in the harshest environments in the world. Interesting, Tim. Thank you for the comment. I'd like to see more information and perhaps add an article on this approach. If you're interested in helping out you can use our page top or bottom CONTACT link to send along suggestions. at BULGED FOUNDATION REPAIR METHODS we illustrate and describe several methods used to stiffen or reinforce bulging foundation walls against further movement. The motive for a decision to reinforce a building foundation rather than rebuild it can be easily understood by noticing the difference in cost between bolting a few vertical steel beams to a building or building a pilaster and the cost to add temporary support to the floors above, remove an existing foundation, and rebuild a new one in its place. 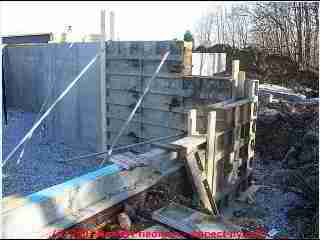 However the decision to support or reinforce a foundation wall versus rebuilding it is often made by the wall itself. If the amount of bulge or bow is sufficiently severe the wall needs to be rebuilt. If the underlying source of wall damage cannot be reliably addressed without excavating outside to add drainage and perhaps water proofing, there is additional motivation to perform a more costly repair. The foundation bulge or lean repair methods listed below are shown roughly in order of their most common appearance in residential buildings. The sketch shown here describes application of a steel I-beam against a masonry block wall for reinforcement. BULGED FOUNDATION REPAIR METHODS where we describe the use of pilasters, reinforcing steel I-beams, foundation anchors, sister walls, steel cables, and even complete foundation wall reconstruction to deal with foundation wall bulging, cracks, leaning, or movement. 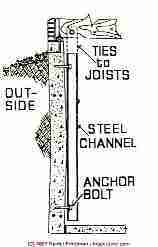 Steel pins for foundation creep repair or prevention: The wall may be pinned to the surrounding soil or hillside. Pinning moving walls is a separate engineering problem and involves a critical step in discovery of the various components in movement (site drainage, footing condition, condition of underlying soils, clay, or rock. Excavation and reconstruction for foundation creep movement Excavation and reconstruction, possibly with reinforcement over original design and with additional foundation and site drainage is often required. Opinions herein are the responsibility of the author. Most of this material has been subject to ongoing peer review but is without any professional engineering analysis. Home inspections may include the discovery of defects involving life, safety, and significant costs. Home inspectors who are not both qualified and certain of the authoritative basis of their conclusions should obtain their own expert advice from qualified experts. This work is also based on the author's construction & inspection experience, training, research, and survey of material from ASHI, and from N. Becker, R. Burgess, J. Bower, D. Breyer, A. Carson, J. Cox, A. Daniel, M. Lennon, R. Peterson, J. Prendergast, W. Ransom, D. Rathburn, E. Rawlins, E. Seaquist, and D. Wickersheimer. Some useful citations are at the end of this paper. Notice that in some Standards there was no mention of observations of damage or unsafe conditions! Engineering and Code Standards: pertain mostly to new construction; engineering analysis of foundation defects and design of repairs is beyond the scope of a professional home inspection and inspector; a home inspector who happens to be qualified to perform such services is not prohibited from doing so on making appropriate arrangements with a client. But notwithstanding Section 4.1 above, the following section requires the inspector to observe and report evidence of significant damage, including to visible portions of the foundation. Significant in this case means in need of immediate major repair; it might also mean in need of further evaluation by a qualified expert. FOUNDATION FAILURES by MOVEMENT TYPE: is the movement active or not, how is the foundation moving: bulging, leaning, settling, etc. ? FOUNDATION FAILURES by TYPE & MATERIAL: how does damage show up in different types of foundation material & what are the implications for collapse risk or repair need? FOUNDATION CRACK DICTIONARY, what is the severity of foundation damage, what is its effect on the stability of the structure, and how urgently are foundation repairs needed? Continue reading at BULGED FOUNDATION REPAIR METHODS or select a topic from closely-related articles below, or see our complete INDEX to RELATED ARTICLES. Or see FOUNDATION REPAIR METHOD FAQs questions about foundation repairs posted originally at this article, and answers to them. 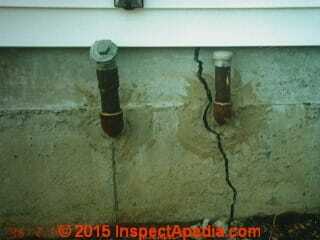 FOUNDATION REPAIR METHODS at InspectApedia.com - online encyclopedia of building & environmental inspection, testing, diagnosis, repair, & problem prevention advice. Quality Standards for the Professional Remodeling Industry, National Association of Home Builders Remodelers Council, NAHB Research Foundation, 1987.